Hey there. Hope you all had a great weekend. 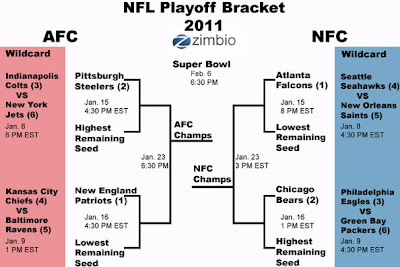 For all non football fans out there, this Saturday was the beginning of the NFL playoffs. Where games matter more and the losses stay with you until next year. This Saturday's lineup included the Seattle Seahawks vs. the New Orleans Saints followed by The Indianapolis Colts vs. the New York Jets. Being a fan, you'd figure that the Saints will roll over the 'Hawks, since the 'Hawks being the only team in history to enter the playoffs with a record below .500. Man.. that was not the case. Simply put, the game was freakin' awesome. Everything you want in a football game. High scoring, hard impact, 4th qtr drama and it was all capped off by this killer run by Marshawn Lynch that has everyone who watched it say, "WOW!". To everyone's surprise, the "lowly" Seahawks came up and defeated the defending Super Bowl champs. Brees had his chance to bring the team back but the unsuccessful onside kick sealed their fate. If you missed this game, you MUST watch it when the NFL Network replays it sometime this week. The Colts vs the Jets game was just as good. The poster boy on NFL QBs, Peyton Manning, is set off to make another run to the Super Bowl against the loudmouth Jets. Classic stuff. And after what seemed to be the game winning 50 yard field goal by K Adam "I don't miss big kicks in play off games" Vinitieri, Jets QB Mark Sanchez came up big by setting his team up for an easy field goal for the win. All in all, an awesome set of games to usher in the playoffs! Sunday morning featured the Kansas City Chiefs vs the Baltimore Ravens. I'll admit that I was rooting for the Chief's to lose. In my opinion, Oakland should have been in their place, but the Raiders screwed up their chance to represent the AFC West. Anyways, The Ravens just destroyed the Chiefs, and just to throw salt into the wound of Oakland fans everywhere... the dreaded "tuck rule" made an appearance in the game. Bitter or not, that tuck rule is a stupid rule and it should be changed or completely scratched out of the NFL rule book. I'm just saying. The afternoon game featured the game of the weekend, The Green Bay Packers vs. the Philadelphia Eagles. The felon turned savior, Michael Vick vs back up to Mr. Favre turned uprising star, Aaron Rodgers. This game had classic written all over it and even though it wasn't a high scoring game like the Seahawks/Saints game, this one was still decided in the 4th qtr in the final minute of the game. QB Vick had the Eagles at the 27 yard line with seconds to go and he was looking for the win when his pass was intercepted in the end zone. Awesome, awesome game. 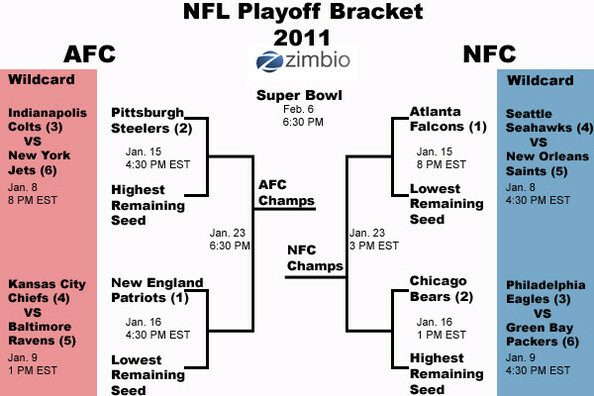 In all honesty, I don't remember a better Wild Card weekend in the NFL. The games were exciting (except the Chief/Ravens game) and they all had their big play moments. If you are an NFL fan you have to be happy with the games this weekend. And wow... I'm still thinking about that Marshawn Lynch run! Here's a video of the play that I found online. The run looked so much like it came from a video game that someone decided to add Tecmo Super Bowl sounds to it! Freakin' awesome! I know for a fact that all football fans everywhere simultaneously said, "UUUHHHH! GET OFF ME!!!!" at the .13 second mark of this video. If you didn't, you are not a fan. lol Enjoy. Later! Yea, it was a great opening weekend. I made my pics for next weekend but there should be a lot of close games again. It's a very competitive year with a pretty much open field. I stopped by and dropped my 2 cents in regards to your picks. Games should be close and we'll see if they'll produce any more awesomeness that last week gave us. Later. Rugby is a good game for a team work...Thanks..